But when I first started, I had no clue where to begin. I was completely intimidated by the blankness of my shiny new Leuchtturm1917 army green journal. 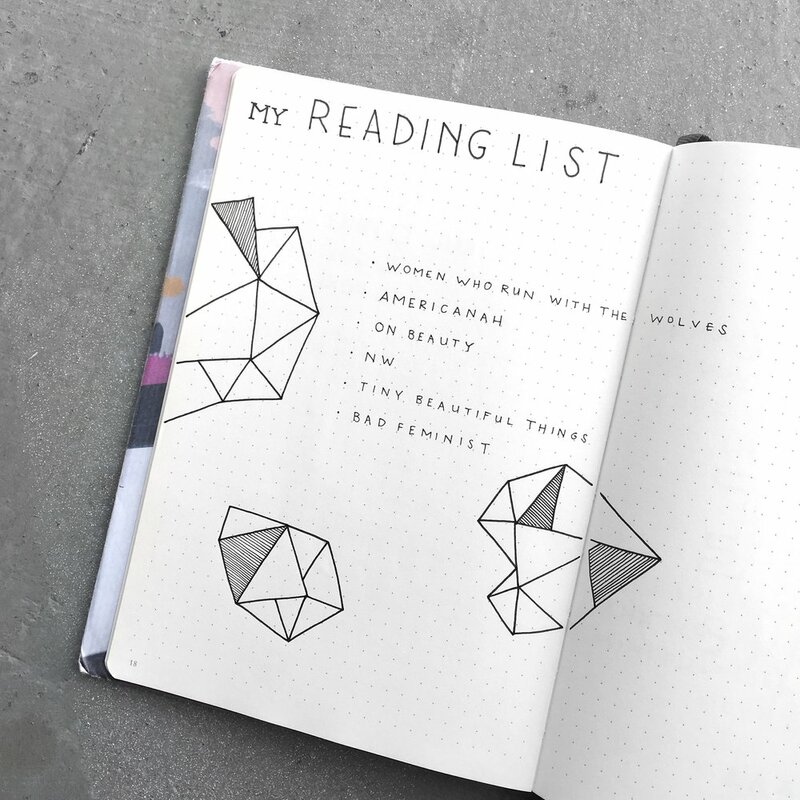 Even after reading the Getting Started guide on Bullet Journal's website, I still felt overwhelmed. After poking around online, I found so many people who felt the same way! Getting started seems to be the biggest hurdle. For me, starting with a blank journal was akin to an artist starting with a blank canvas who's suffering from a creative block. I dreamt of crisp pages with beautiful handwriting and amazing weekly/monthly spreads. And I was scared that reality wouldn't live up to my high expectations. The first pages of my notebook were so awful. My handwriting was out of practice and my layouts were messy and confusing. I ended up running out to get correction tape and eventually had to tear out a few unsightly pages. I love using Pinterest to keep track of the different layouts that I like. I also keep track of different lists/collections, handwritten font ideas, or doodles that I want to try out. This way, when I have some time to journal I can easily refer to my Pinterest board for some inspiration. If you plan on posting photos on Instagram, it also acts as a way to keep track of who to credit and tag in your posts. This seems a little extreme (and expensive), but if your inner perfectionist is as strong as mine then this works wonders. I have a practice journal that I use. It is full of scribbles, handwriting practice, stamp tests and sketched out layouts. I often use it when I'm trying to space out a header for a new list/collection. It has also helped to improve my weekly and monthly layouts. My first few layouts didn't turn out the way I expected. I had pictured something in my mind and when I put that idea to paper and inked everything out it just didn't feel right. Either I didn't leave enough room for a quote, or my spacing was somehow off. 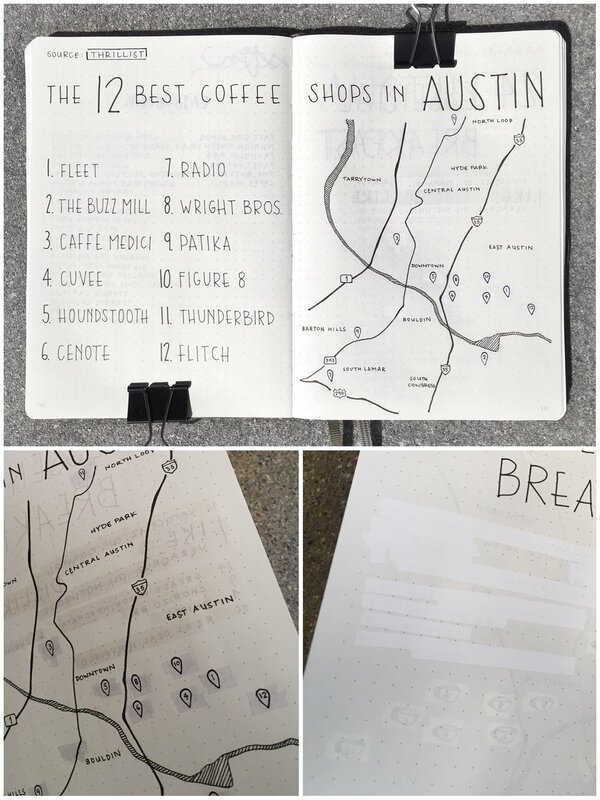 The practice journal allows you to experiment before actually committing to a design in your actual journal. I use a Leuchtturm1917 A5 dotted journal. The journal measures 26 boxes across and 38 boxes down. Instead of counting each individual box, I line up my grid guide to my journal and the handy marks easily tell me where half points are. 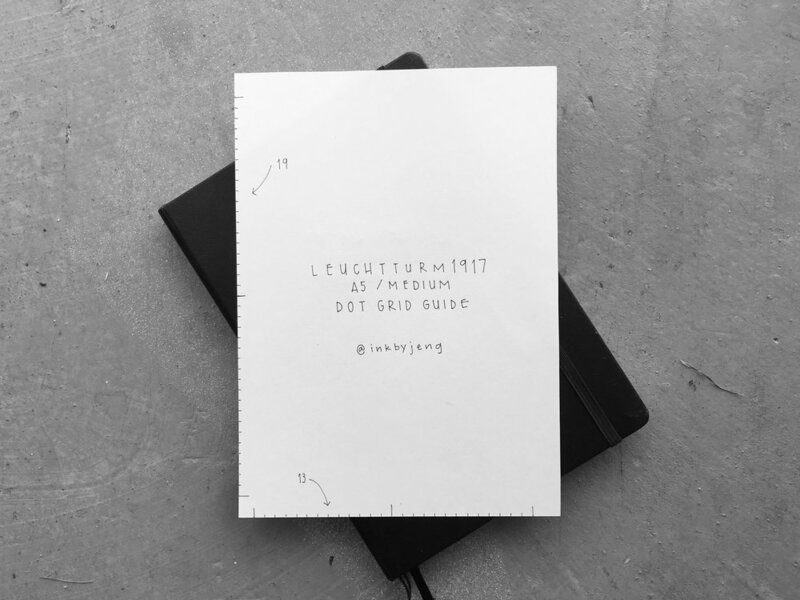 This paper guide can be kept in the envelope at the back of your journal. When I first started, I felt very apprehensive about using a pencil. For some reason I felt like it was cheating! I've decided now that it's only cheating if you've made it a challenge for yourself not to use a pencil. If you didn't make that personal challenge, feel free to bust out with that pencil and get to making those grid guides. I often pencil the guidelines for my more complicated outlines. I even use my pencil for spacing out my lettering. Without my pencil, my headers end up too long and flow off the page making me sorely disappointed. Other times words are so off centered it drives me crazy. Correction tape works great to fix small boo boos (and big ones) in your journal. I use this when I misspell words or extend lines too far out from my planned layout. But as a word of caution, ink on top of correction tape is easily smeared. I suggest using your practice journal to test your pens on the correction tape and do a smear test. Also, popular journals like Leuchtturm1917 and Moleskine use off white paper, and most correction tape is bright white. Even this small color mismatch might cause your inner perfectionist to cringe, but at least your layouts will be pretty! Here's an example of me using correction tape in my Leuchtturm. In some lighting the tape is very noticeable, but once you take the photos and auto-correct the white balance, it's not as noticeable. You can see I switched from coffee cups to traditional map markers. Living in the digital age has caused my handwriting to get a little rusty. I've joined this monthly challenge as a way to improve my own writing style. It involves a series of prompts that allow you to play and experiment with your handwriting. Most of the time I use this to play with new lettering styles and spacing to incorporate into my new layouts and headers. To find the latest challenge, search through Boho.Berry's Instagram account to find this month's challenge prompts. This is a great challenge and Facebook group to join. The community is so creative and willing to share. You will find new ways to use your journal and find great inspiration. Check out #PlanWithMeChallenge's official Instagram account to join! Now that you have an arsenal of ways to silence your inner perfectionist, let's start with a few simple and easy page ideas to get you going. These are meant to be as simple or as complicated as you want. Book List: This one is an easy one! List 3-5 books that you've already read. That way you can feel accomplished by marking off a few items. Then add 3-5 books that you are planning to read. Travel Bucket List: Use the same idea as your book list. 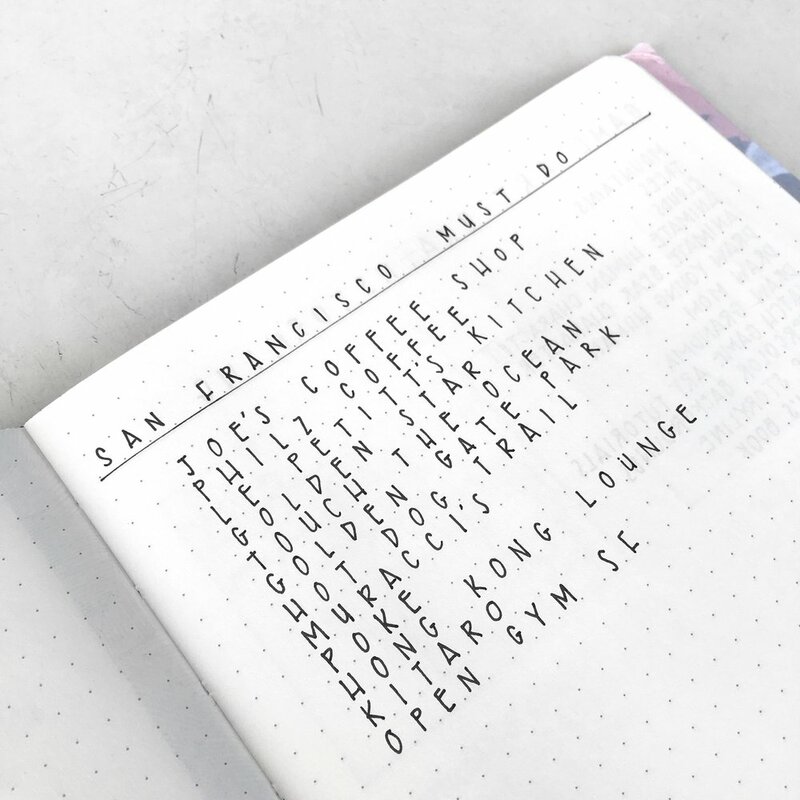 List 3-5 places that you've already crossed off your bucket list. Then add 3-5 places you would like to travel to. Monthly Gratitude Log: You can start this mid-month or wait till the beginning of the month. Write out a list of numbers and each day write a few words about what you're grateful for. And that's it! 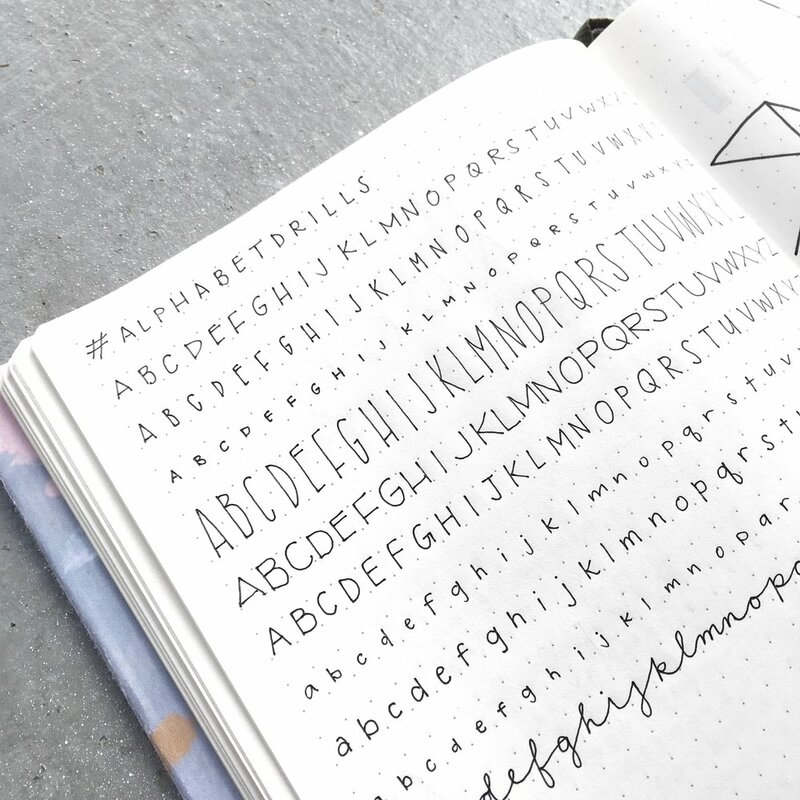 Regardless if you're new to the Bullet Journal system, or if you're a seasoned veteran, your inner perfectionist will thank you for following these tips. I know mine has! Let's keep journaling, planning and making pretty things together. Reach out to me on Instagram @inkbyjeng and let me know if you have any other ideas!